My Wordless Wednesday posts are usually ACTUALLY wordless... but today... not so much. We have had a spectacularly crappy couple of days but I want to share something GOOD with you all, because even in the midst of crap I am truly thankful. 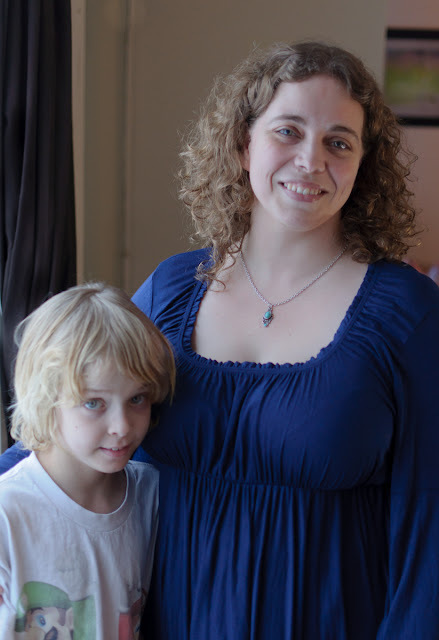 The other day I asked my husband to take a picture of me wearing my pretty new shirt and necklace from Satin Woods for my Blissdom post and while he was doing that my son Aiden came over and was being incredibly sweet. He told me he liked my new shirt and necklace. He told me he thought I looked pretty and that he loves me and my "squishy-ness" (and yes, I will take that as a compliment thank-you-very-much). He didn't stay long- just a few minutes - but Doug managed to get a couple pictures of the two of us together. Aiden's hugs make my heart happy. I was looking for a picture for Wordless Wednesday today and when I saw this picture I wanted to share it with you all and give you an update about Aiden and his special request for a friend. For those of you who don't know Aiden has Autism and he has been praying for a friend. I shared about his heart-wrenching request in a post last week and I received some truly beautiful comments in the days since that post went live. If you haven't read it you really should go read the wonderful words people left for me. Thank-you all so much for your kind words and prayers. Did you hear me? Because I really mean it. THANK-YOU for taking the time to comment, to tell me your stories, to pray for my son, to share your hearts and you friendship with me. YOU- my online friends are a beautiful gift to me and I am so grateful. I am also so sorry that so many of you have had to watch your children struggle to find friends. It is so painful. As much as it helps to know we are not alone in our struggle I still find it heart-breaking to know that there are so many children feeling so alone right now. Since my life is supremely weird it turns out someone from my son's school reads my blog (hi!). The morning after I wrote that post I was greeted at the school with a plan for helping Aiden make a new friend at school. Aiden's teacher and his aide were ON IT!! And you know what I saw when I got to school today? Aiden goofing around with a kid I had never seen him play with before. Sure he was invading this poor child's personal space but the kid was smiling and Aiden was laughing! I realize that doesn't mean he has a new best friend or anything but it is a start! It is a step in the right direction! And I can't even begin to tell you how thankful I am that we have amazing people like Aiden's teacher & Aide in our corner, helping our son. We are still praying every night for a friend for Aiden, a special friend who will say "hey Aiden, do you want to play with me?"... but now I know that we have people praying all over the world for a friend for Aiden and his-as-yet-unknown-friend and even as I type that I have tears of thankfulness streaming down my face. So thank-you dear friends. Thanks for caring. How's that for a not-so-Wordless-Wednesday post?